Tag Archives: Billy Frank Jr. 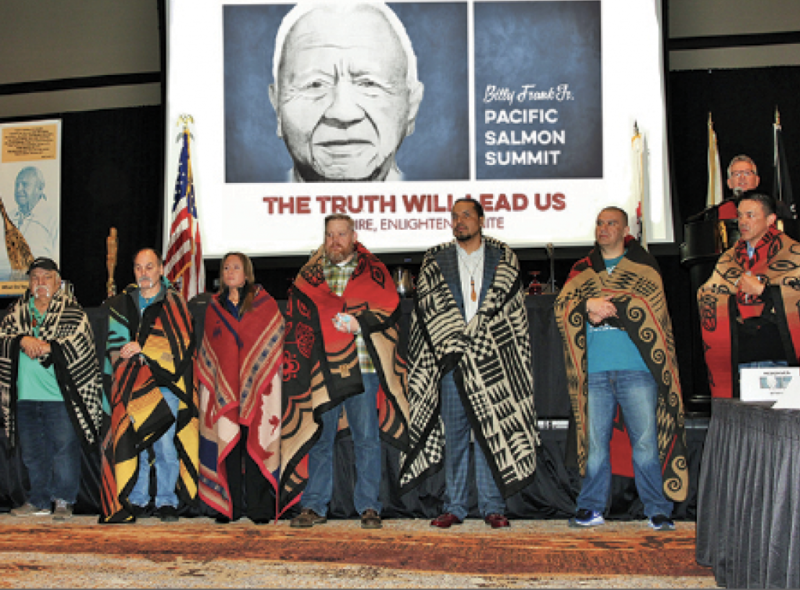 The life and legacy of Billy Frank Jr. was honored on March 19, as a dynamic group of tribal leaders and state representatives assembled for the Billy Frank Jr. Pacific Salmon Summit, held at the Orca Ballroom in the Tulalip Resort Casino. The goal was to continue the teachings of a fearless leader and historic visionary, while igniting others to carry the torch to advance and strengthen policies to protect and defend salmon and salmon habitat. Billy Frank Jr., who died four years ago in May, committed his life to protecting his Nisqually people’s traditional way of life and to protecting the endangered salmon whose survival is the focus of tribal life. Beginning with his first arrest as a teenager in 1945 for “illegal” fishing on his beloved Nisqually River, he became a leader of a civil disobedience movement that insisted on the treaty rights (the right to fish in “usual and accustomed places”) guaranteed to Washington tribes more than a century before. His activism ultimately led to the Supreme Court’s landmark Boldt Decision in 1974, affirming Native American treaty fishing rights. The Boldt Decision held that the government’s promise to secure the fisheries for the tribes was central to the treaty-making process, and allocates 50 percent of the annual catch to treaty tribes. Pacific salmon have long played an essential role in the cultures and lives of the Indigenous People of the Pacific Northwest. Today, salmon and their precious habitat are in a critical state because of unchecked commercial fishing, waterway contamination, habitat destruction, net-pen farming, and road culverts that restrict fish habitat. 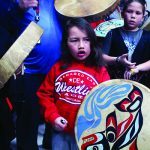 In order to ensure future generations can continue to practice their traditional ways of life, existing efforts to protect the salmon must be enhanced and strengthened. That is why the Billy Frank Jr. Pacific Salmon Summit was the perfect opportunity for tribal leaders, fishery managers, policy makers, state representatives, scientists, and the public to come together and discuss strategies for protecting salmon for the future. The Pacific Salmon Summit opened with traditional drumming and prayers by the Tulalip Canoe Family. 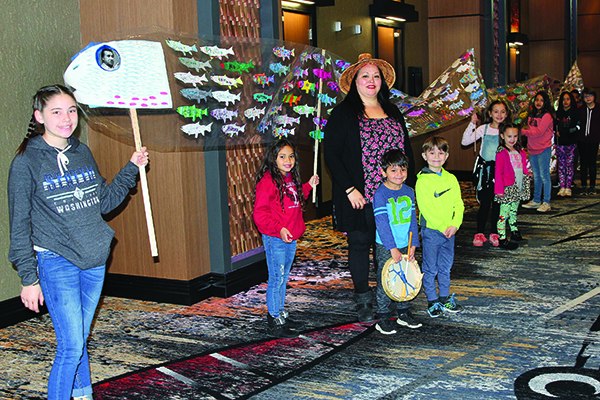 As the welcome song echoed through the Orca Ballroom, students from Quil Ceda Tulalip Elementary proudly displayed their banner created from hundreds of salmon cutouts they created during Billy Frank Jr. spirit week. Speaking beneath a conference banner bearing Billy Frank Jr.’s portrait and the slogan, “The Truth Will Lead Us,” Quinault Indian Nation President, Fawn Sharp, gave the summit’s keynote address. “I saw Billy as a historic visionary. He had this ability to go back to treaty time and had an incredible understanding of what those words meant,” Fawn said. “As a visionary, he understood the many challenges facing humanity, facing our generation. Billy would want people to come together to have a real discussion and understand the current state of the salmon. A most diverse gathering, the summit brought together a broad range of people to share information and exchange ideas about how to continue to restore and protect salmon. Together, participants in the inaugural Billy Frank Jr. Pacific Salmon Summit identified and developed an advocacy strategy to strengthen protection policies for salmon and salmon habitat. The summit wrapped up with a call to action to challenge the status quo, and to create meaningful partnerships with co-managers who will work as diligently and responsibly to protect the salmon as tribal programs do. A work group was formed to develop proposed actions and investigate conflicts and failings in reaching recovery objectives. Their common goals include increased use of hatcheries and more aggressive salmon habitat restoration. 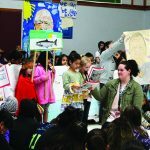 The summit was sponsored by the Tulalip, Lummi, Puyallup, Squaxin Island, Snoqualmie and Nisqually tribes and organized by Salmon Defense, a nonprofit salmon recovery group founded by the late Billy Frank Jr.
Be Like Billy: Quil Ceda Tulalip Elementary Celebrates Billy Frank Jr.
Billy Frank Jr. is a hero, especially to Northwest Indigenous tribes. Hailing from Nisqually, Billy learned at a young age that salmon are integral to the Coast Salish traditional way of life. At 14, he was arrested for seine fishing in non-reservation waters of the Nisqually River. Billy knew his arrest was in violation of his treaty rights and that experience marked the beginning of his active advocacy for tribal fishing rights. He understood that the treaties signed by the United States Government and Washington State tribes guaranteed his people the right to fish the same waters his ancestors did since time immemorial. The state of Washington attempted to deny, restrict and regulate where and how Native Americans were fishing during the sixties and seventies, an era known as the ‘fish wars’. During this time Billy organized ‘fish-ins’ or gatherings where Natives exercised their fishing rights. Natives were arrested and many times beaten during the fish wars. Billy was arrested for civil disobedience on more than fifty occasions. The arrests led to lawsuits which in turn helped lead to the Boldt Decision, a federal case between the United States and Washington State which reaffirmed the tribes’ right to fish. After the Boldt Decision and up until his passing in 2014, Billy focused on protecting the environment and preserving the salmon habitat for future generations. 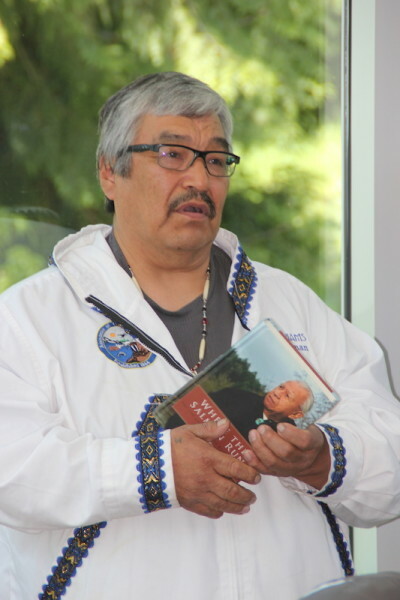 He received several accolades for his activism for treaty rights as well as his advocacy for environmental protection, including the Presidential Medal of Freedom. 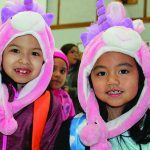 Throughout the nation, during the first week of March, students participate in a Dr. Seuss inspired spirit week. 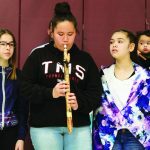 The students of QCT, however, participate in a spirit week which honors the northwest Native American hero Billy Frank Jr. by teaching about, and therefore continuing, his legacy. During Billy Frank Jr. 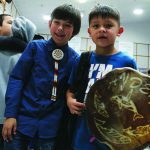 Spirit Week, the students had a blast making arts and crafts, learning new songs and participating in themed days all while preparing for a community cultural celebration on Billy Frank Jr. Day. Themes included Salmon Day where students made a collaborative art piece, the length of the school’s entrance to the gym, displaying multi-colored paper cutout salmon swimming upstream; as well as Water is Life Day in which the students were encouraged to wear blue to show support of protecting our waters. The students also celebrated Twin Day and Tell Your Story Day. QCT begins each day with a morning assembly. During spirit week, students learned about Billy together during the assembly. The students were even treated to the award winning Billy Frank Jr. cartoon, σčəδαδξʷ, which is a fun animation based around his voice from a recorded interview about the lifecycle of salmon. 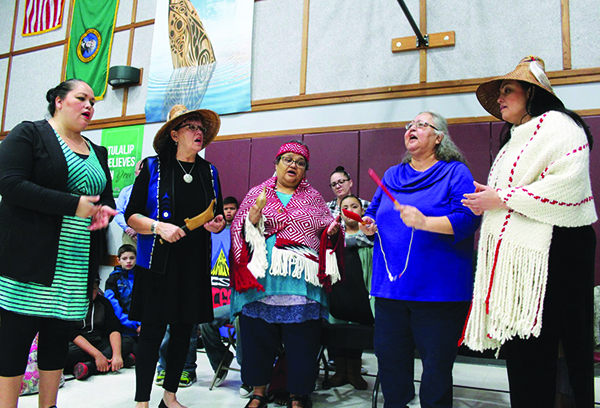 Throughout the spirit week, Tulalip tribal leaders spoke to the kids about treaty rights, environmental protection and also shared stories of Billy. Guest speakers included Patti Gobin, Deborah Parker, and Inez Bill as well as Glen Gobin and Ray Fryberg. “Billy said the next big battle is protecting the environment because the salmon need a place to come back to. I’m really happy that the school is sharing the efforts of Billy Frank Jr. and what he stood for because he was a great man and a great example of a true leader for the Indian People,” shared Ray. 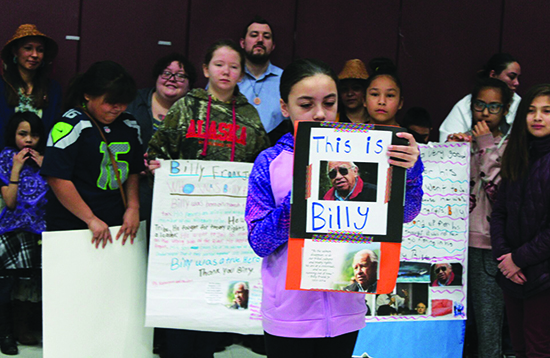 On Billy Frank Jr. Day, the morning assembly was extended to two-hours and the students showcased everything they learned about Billy for the community. 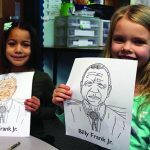 The students were featured in class presentations as well as a video presentation where the kids emotionally boasted, ‘I am Billy Frank Jr.!’ at the end. The Tulalip community joined QCT in traditional song and dance to conclude the ceremony and QCT’s second annual Billy Frank Jr. Spirit Week. Students honor the legacy of Billy Frank Jr. Many schools across the nation celebrate the works of beloved children’s author Dr. Seuss by hosting a spirit week each March during his birthday week. 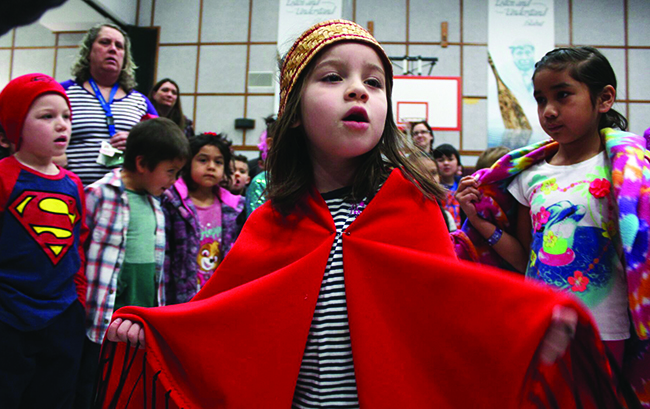 This tradition is practiced annually at Quil Ceda Tulalip Elementary (QCT.) 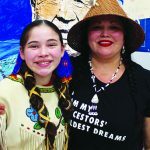 But before preparations for this year’s Dr. Suess week began, Chelsea Craig, Tulalip tribal member and QCT instructor, suggested the school celebrated another national hero, Billy Frank Jr., whose passion for preserving fishing rights for Washington State tribes has made a positive impact for both Indian Country and the environment for generations to come. QCT celebrated by learning about the Native American activist every day during his birthday week, March 6-10. In 1854 and 1855 the State of Washington met with several local tribes to sign treaties in order to designate land for the tribes. Each tribe received a portion of land where the state would provide schools and medical care. The treaties allowed the tribes to retain the right to hunt, gather and fish at all usual and accustomed grounds. 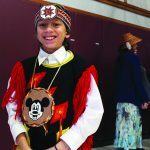 Ninety years after the treaties were signed, fourteen-year-old Billy Frank Jr. of the Nisqually Indian Tribe, was arrested for fishing on off-reservation land on the Nisqaully River. This was the first of over fifty arrests for Billy and ultimately led to the fish wars and the Boldt decision, a landmark court case that affirmed tribal fishing rights; subjects that were studied during Billy Frank Jr. week at QCT. Billy actively fought his entire life not only for fishing rights but also for the environment. He served as the chairman of the Northwest Indian Fisheries Commission for over thirty years. Billy passed away in 2014 and was posthumously awarded the Presidential Medal of Freedom by President Obama. 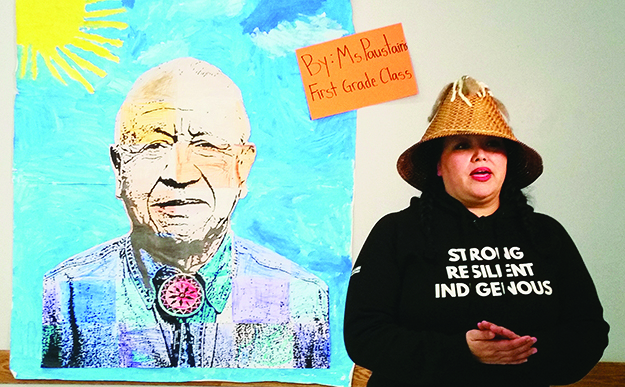 Quil Ceda Tulalip Elementary students display their school-wide art project in honor of Billy Frank Jr. 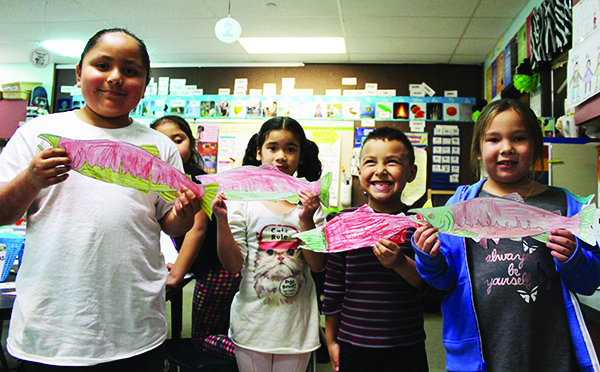 The students designed paper salmon printed with their name and why they believe Billy’s work was important to Native America. Their artwork, laminated together, gave the illusion of salmon swimming upstream. The school’s spirit week concluded with a two-hour assembly in honor of Billy, that included artwork as well as traditional song and dance by the students. Also in attendance were Billy’s son Willie and members of the Tulalip Tribes Board of Directors. 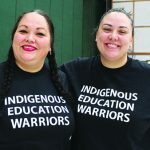 “Billy’s fight started as a battle for a right to continue to do what he and his ancestors have done for thousands of years and he went to jail many, many times fighting for that right, which is secured in a treaty with the United States. 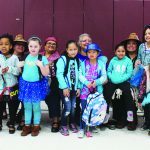 Since that time, there’s been many battles and struggles in trying to preserve that right,” explained Tulalip Board member Glen Gobin. 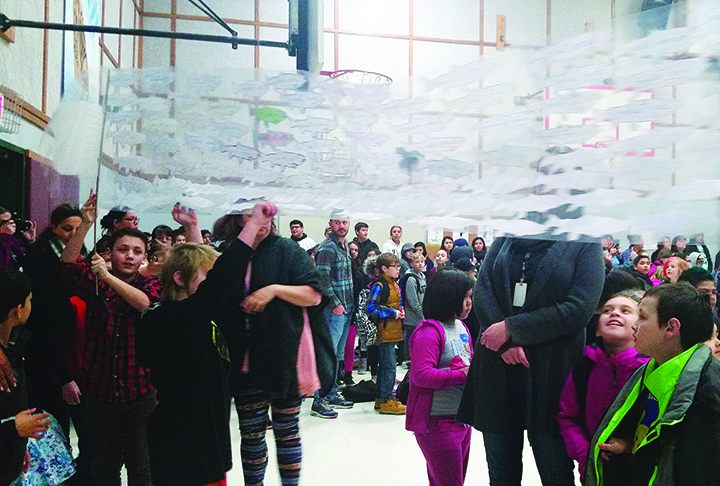 Salmon appeared to be swimming through the elementary gymnasium as students displayed a school-wide art project. 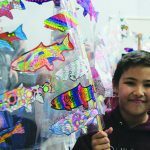 Each student decorated paper cut-out salmon which were then laminated together, giving the illusion of fish swimming upstream. The students also remixed the B-I-N-G-O nursery rhyme to the tune of B-I-L-L-Y. The fifth grade class created a video in which they spoke of Billy’s career and legacy. 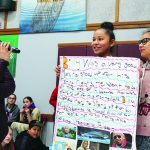 During the video several students thanked him for his work, stating the battle he fought allows their family members to exercise their fishing rights, as many parents are fisherman or work in fisheries. National wildlife refuge renamed to honor Billy Frank Jr.
A national wildlife refuge near Olympia, Washington, has been renamed in honor of Native American civil rights leader Billy Frank Jr.
OLYMPIA, WASH. – A national wildlife refuge near Olympia, Washington, has been renamed in honor of Native American civil rights leader Billy Frank Jr.
U.S. Interior Secretary Sally Jewel, U.S. Sen. Maria Cantwell, U.S. Rep. Denny Heck and Nisqually Tribal Council chairman Farron McCloud are among those attending Tuesday’s celebration at the renamed Billy Frank Jr. Nisqually National Wildlife Refuge. Frank, who died in 2014, was a Nisqually tribal fisherman who led the “fish wars” of the 1960s and 70s that restored fishing rights and helped preserve a way of life for Native Americans in the Pacific Northwest. He and others were repeatedly arrested for fishing in the Nisqually River as they staged “fish-ins,” or acts of civil disobedience similar to sit-ins, to demand the right to fish in their traditional places. His activism paved the way for the landmark “Boldt” court decision, which affirmed the rights of Western Washington treaty tribes to half the fish harvest in the state. Tuesday’s ceremony also celebrates the newly established Medicine Creek Treaty National Memorial, which commemorates the spot in 1854 where tribes signed the Medicine Creek Treaty with the U.S. government. The tribes include the Nisqually, Squaxin Island Tribe, Puyallup Tribe of Indians and Muckleshoot Indian Tribe. The treaty was signed in a grove of trees near what is now McAllister Creek in the refuge. The tribes ceded land to the U.S. government but reserved their rights to fish, hunt and gather in their traditional places. For decades, Frank fought to hold the federal government to those treaty obligations. In November, Frank was posthumously awarded the Presidential Medal of Freedom by President Barack Obama. A month later, Obama signed into law the “Billy Frank Jr. Tell Your Story Act,” which renamed the wildlife refuge. The 2,925-acre preserve was created in 1974 and protects one of the few relatively undeveloped large estuaries left in Puget Sound. It’s an important stop for migratory birds along the Pacific Flyway. It’s managed by the U.S. Fish and Wildlife Service. Billy Frank Jr., longtime chairman of the Northwest Indian Fisheries Commission, received many awards during his life and continues to be honored since his passing in 2014. His life was celebrated last month when President Barack Obama posthumously awarded him the Medal of Freedom. It is the nation’s highest civilian award. Billy would have been delighted to receive the medal, but even more delighted by the attention that such an award can bring to the issues he fought for every day: protection of tribal cultures, treaty rights and natural resources. We hope the United States will honor not only Billy’s life, but also his dream, by taking action on the Treaty Rights at Risk initiative that was the focus of his efforts for the final four years of his life. Salmon recovery efforts cross many federal, state and local jurisdictions, but leadership is lacking to implement recovery consistently across those lines. Billy believed that the federal government has a duty to step in and lead a more coordinated and effective salmon recovery effort. The federal government has both the legal and trust responsibility to honor our treaties and recover the salmon resource. That’s why he called on tribal leadership to bring the Treaty Rights at Risk initiative to the White House in 2011. It is a call to action for the federal government to ensure that the promises made in the treaties are honored and that our treaty-reserved resources remain available for harvest. Tribal cultures and economies in western Washington depend on salmon. But salmon are in a spiral to extinction because their habitat is being lost faster than it can be restored. Some tribes have lost even their most basic ceremonial and subsistence fisheries – the cornerstone of tribal life. Four species of salmon in western Washington are listed as “threatened” under the Endangered Species Act, some of them for more than a decade. “As the salmon disappear, so do our tribal cultures and treaty rights. We are at a crossroads, and we are running out of time,” Billy wrote not long before his passing. Over the past four years under the Treaty Rights at Risk initiative, we have met often with federal agency officials and others to work toward a coordinated set of salmon recovery goals and objectives. Progress has been slow, and at times discouraging, but we remain optimistic. An important goal is to institutionalize the Treaty Rights at Risk initiative in the federal government through the White House Council on Native American Affairs, created by President Obama in 2013. Economic development, health care, tribal justice systems, education and tribal natural resources are the five pillars of the council. With one exception – natural resources – subgroups have been created for each pillar to help frame the issues and begin work. That needs to change. A natural resources subgroup is absolutely essential to address the needs of Indian people and the natural resources on which we depend. A natural resources subgroup would provide an avenue for tribes nationally to address the protection and management of the natural resources critical to their rights, cultures and economies. We are running out of time to recover salmon and we are running out of time for the Obama Administration to provide lasting and meaningful protection of tribal rights and resources. Recent meetings with federal officials have been encouraging. We are hopeful that the natural resources subgroup will be created in the coming year. The creation of a natural resources subgroup for the White House Council on Native American Affairs would truly be a high honor that the United States could bestow on Billy’s legacy. The Legacy of Billy Frank Jr. It has been a long year since Billy Frank Jr. walked on from this world on May 5, 2014. We deeply miss our longtime leader and good friend. We will continue to stay on the course he set for us as sovereign nations with treaty-reserved rights who co-manage the natural resources given to us by the Creator. During this past year, Billy’s life as a champion of tribal sovereignty, treaty rights and natural resources has been honored widely by tribal, state and federal governments, conservation organizations and others. His March 9 birthday has been declared a holiday by many of the treaty Indian tribes in western Washington. At the Squaxin Island Tribe, a street leading to the tribe’s natural resources building has been named Billy Frank Jr. Way. The state of Washington gave Billy a Medal of Merit to honor his lifetime of service to all of the people of Washington. The award recognizes that Billy’s “courage, determination and leadership resulted in unique and meaningful contributions to our state and helped make Washington a better place to live,” said Washington Gov. Jay Inslee. The state Senate passed a resolution recognizing his legacy. “Through his lifetime of kinship with the natural world, Billy Frank Jr. helped create a healthy environment that can sustain salmon, achieved change, and brought diverse communities together around shared desires through nonviolent means,” according to the resolution. At the federal level, a bill to rename the Nisqually National Wildlife Refuge for Billy has been introduced by U.S. Rep. Denny Heck. The bill also would create a national historic site at the refuge to mark the place where the Medicine Creek Treaty was signed in 1854. There is no question that all of these awards and honors are sincere and well-deserved. They are important because they help us to remember Billy and what he stood for: the protection of tribal cultures, sovereignty, treaty rights and the natural resources that sustain Indian people. Mike Williams, KRITFC chair, speaks at a recent meeting of the NWIFC. But it is a recent event in Alaska that is perhaps the best example of Billy’s legacy. When the indigenous Yupik people of southwestern Alaska were being denied their right to harvest salmon by state and federal fisheries managers, they called Billy. He visited several times to provide encouragement and help the Yupik achieve their dream of co-managing their shared natural resources. On May 5, the first anniversary of Billy’s passing, 33 Yupik villages on the river came together to create the Kuskokwim River Inter-tribal Fish Commission. Through the KRITFC, the Yupik will no longer serve only in an advisory role, but will work as co-managers with state and federal fisheries managers. “It was a great day for the Yupik people,” said Mike Williams, who was elected as the first chairman of KRITFC. “The legacy of Billy Frank is stronger now than ever before, and will get stronger,” he said. We will continue to honor that legacy by carrying on Billy’s work to recover salmon and safeguard our treaty-reserved rights as co-managers of the natural resources that have always sustained us. Heck introduces bill to honor Billy Frank Jr. The Nisqually National Wildlife Refuge could soon be renamed the Billy Frank Jr. Nisqually National Wildlife Refuge if a measure introduced by Congressman Denny Heck (D-Wash) is approved. House Resolution 2270 would also create a national historic site where the 1854 Medicine Creek Treaty, which established reservations and fishing rights for Puget Sound tribes, was signed. Co-sponsors of the bill include Washington’s entire congressional delegation, Native American Caucus co-chairs Tom Cole (R-Okla.) and Betty McCollum (D-Minn.), Subcommittee on Indian, Insular and Alaska Native Affairs Chair Don Young (R-Ala.), and Congressman Raúl Grijalva (D-Ariz.), ranking member of the National Resources Committee. Nisqually Wildlife Refuge would be renamed for civil rights hero Billy Frank Jr. 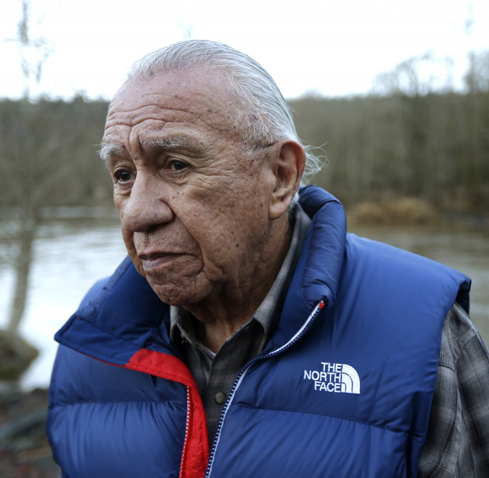 The state’s congressional delegation, showing rare bipartisan unity, plans next week to introduce legislation that would rename the Nisqually National Wildlife Refuge in honor of Billy Frank Jr., champion of native fishing rights and a Washington civil rights hero. Frank was viewed differently when he launched Indian fishing rights protests on the Nisqually in the 1960′s. He was arrested 50 times, starting at the age of 14, for “illegal” fishing on the Nisqually River, where he was born and lived, and where his ancestors lived. He died last year, at 83, as a recipient of the Albert Schweitzer Humanitarian Award, a person of vast credibility who began with a simple message. “He said simply, Treaties are the word of America, and America should keep its word,’ ” ex-Gov. Mike Lowry recalled. The struggle for fishing rights became a seminal — perhaps THE seminal — episode in the modern history of Native-American rights. How so? “Billy was the spear point in treaty rights,” Heck added. In later years, Frank would replace confrontation with cooperation in restoring the salmon runs that help define the Pacific Northwest. “When a bunch of Really Important People get together in a conference room, you can always tell Mr. Frank even from afar,” author Timothy Egan once wrote. Amid the government and corporate executives, all tasseled loafers and silk ties, he’s the one with the long pony tail, the gold salmon medallion and the open necked shirt. The Nisqually Wildlife Refuge is a suitable honor. Frank lived to see levies and dikes come down at the mouth of the Nisqually River, with estuary habitat restored where salmon can grow up, and where visitors can witness a multiplicity of shore birds. “The absence of natural estuaries like this is part of the reason why the region is still going backwards rather than forwards on Puget Sound salmon,” Heck noted. Heck has done his homework on the bill. He has lined up as a cosponsor influential Oklahoma Republican Rep. Tom Cole, a member of the Chickasaw Nation. He has also signed up Alaska’s crusty Republican Rep. Don Young. Canada geese in the Nisqually National Wildlife Refuge, a sanctuary for birds and a place where young salmon can grow up. A cosponsor from this state, Rep. Cathy McMorris Rodgers, is a usually hyper partisan member of the House Republican leadership. “Her signing on says to the leadership, ‘This is O.K.’,” said Heck. He has also secured backing from the Northwest Indian Fisheries Commission — long headed by Billy Frank — and the National Congress of American Indians. Brian Cladoosby, chairman of the Swinomish Tribe, is currently president of the congress. 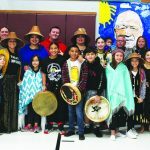 The legislation, officially “The Billy Frank, Jr., Tell Your Story Act” creates an opportunity for the Nisqually, Muckleshoot, Puyallup and Squaxin Island tribes to tell their stories. The U.S. Interior Secretary will coordinate with then creating materials for the Medicine Treaty National Historic Site. Bill Frank made his last appearance just over a year ago, at a meeting in Suquamish with U.S. Interior Secretary Sally Jewell. Just over a week later, he died. “When Billy spoke, you listened: We saw that firsthand just last week when he commanded a room that included tribal leaders, fisheries officials and the secretary of the interior,” U.S. Rep. Derek Kilmer, D-Wash., recalled of the meeting. Not bad for a guy with a ninth-grade education.”Today, because of the Boldt Decision, the state and tribes are partners in the management and preservation of resources that are foundational in the economy of the state,” Sen. Maria Cantwell, D-Wash., said in eulogizing Frank. Just as Frank spoke of cooperation and conservation, the wildlife refuge at the mouth of the Nisqually speaks of Billy Frank Jr.
OLYMPIA…The state Medal of Merit and Medal of Valor will be presented during a joint session of the Legislature Wednesday at 11 a.m. in the House Chambers in the state Capitol. Gov. Jay Inslee will award the medals. The Medal of Merit will be presented to Gretchen Schodde and posthumously to Billy Frank Jr.
Schodde, of Union, Mason County, is receiving the award in honor of her work as founder of Harmony Hill Retreat Center in Union, which focuses on wellness and renewal for individuals and families affected by a cancer diagnosis. Frank, a longtime Olympia area resident who died last May, is being honored for his tireless work as a Nisqually tribal leader and dedication to the plight of Northwest salmon, the environment and peace between diverse cultures. Frank’s sons, Willie and Tobin Frank, will accept the medal on his behalf. The Medal of Valor will be given to the communities Oso, Darrington, Arlington and Sauk-Suiattle Indian Tribe for their recovery and relief efforts following the Oso landslide tragedy last March. The Office of Secretary of State oversees the Medal of Merit and Medal of Valor program.